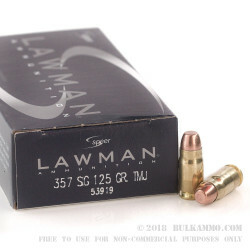 It’s no surprise to those who are in the industry that Speer has such a well behaved, consistent product line in the Lawman line of their ammunition portfolio. They’ve been gathering data and honing their craft for decades on the back of law enforcement contracts that have perennially been a big part of their revenue stream with their consumer cartridge lines producing well also. The company is generally a top three contract holder with law enforcement agencies, and of late has been the number one seller by volume to LE contracts of any supplier in the USA. 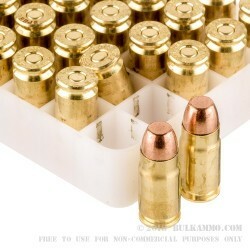 All these contracts allow them some unique insights to what it takes to make a round that can keep hundreds of thousands of police officers and corrections officers and special agents happy on the range. It translates directly to Speer’s success in the civilian market. 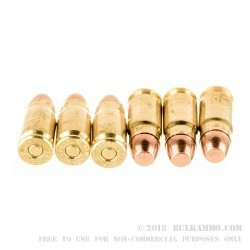 This is the .357 Sig round that features a copper clad TMJ (total metal jacket) projectile in 125 grain weight with a Boxer primed brass case that is hot enough to cycle all of the mainstream production firearms in the caliber, but not so hot as to be annoying to shoot. 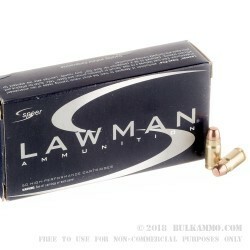 It’s a bit more expensive than the cheapest ammunition but for the crowd who wants to buy 100% made in the USA, or who knows the brand and wants the peace of mind of shooting ammunition that works every single time: Speer Lawman is the obvious choice.